Yesterday every man and his dog released their April comic book solicits upon the unsuspecting public. Full of killer debut issues like Black Widow, Brightest Day and S.H.I.E.L.D. they spelt certain doom for those of us planning to make ‘get the comic pull list in order’ a new years resolution. The ultimate motivation to bend the rules? DC's pair of stand-out #1's; The Spirit and Doc Savage. The Spirit may just be where the back-up feature eclipses the main event. No offence to writer Mark Schultz or the amazing artistic find of Moritat, but if the notion of industry icons like Dennis O’Neil and Bill Sienkiewicz putting their own spin on Eisner’s legendary creation, in pure black and white, doesn't see money jump from your wallet - nothing will. 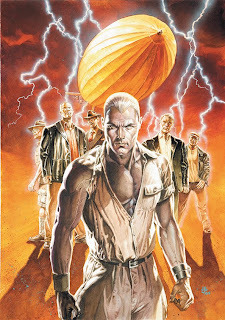 For rule breakers after a bit more CMYK with their bone breaking, my money lands firmly on Doc Savage. I've already blabbed on about why the Man of Bronze deserves your respect, DC seals the deal, with covers by John freakin' Cassaday, and J.G. Jones, plus interior art by Howard 'I did the JLA - I can do epic' Porter. With Doc Savage a guy who looks his 'Sunday best' in a less illustrated style, his book would be perfect choice for Howard's Trials Of Shazam paint like skills. As for scripting duties, the publisher who turns 75 next month gets bonus points for tapping novelist Paul Malmont to script the debut arc, The Lord of Lightning. 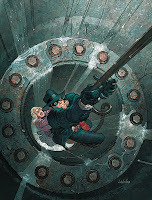 See rules truly are made to be broken, these books the first expansions into DC's all new pulp/noir universe, prove exactly that - New Years Resolutions included.